How long have you been one of SC Choirs’ accompanists? Since September 2009 - 9 years! You currently accompany our Junior Voices. What do you enjoy most about being part of SC Choirs? We have such fun! It’s wonderful working in such an uplifting environment, and I’m so lucky to be able to make a living out of music, something I love. I also met my wife through SC Choirs, of course! Have there been any funny or amusing moments over the years? What’s been your most favourite moment? Do you ever get nervous accompanying the choir? I don’t get nervous accompanying concerts, but I used to get terribly nervous for the competitions. Nerves is something I’ve always suffered with, but luckily it’s under control now! When you’re not accompanying for us, what else do you do during the week? 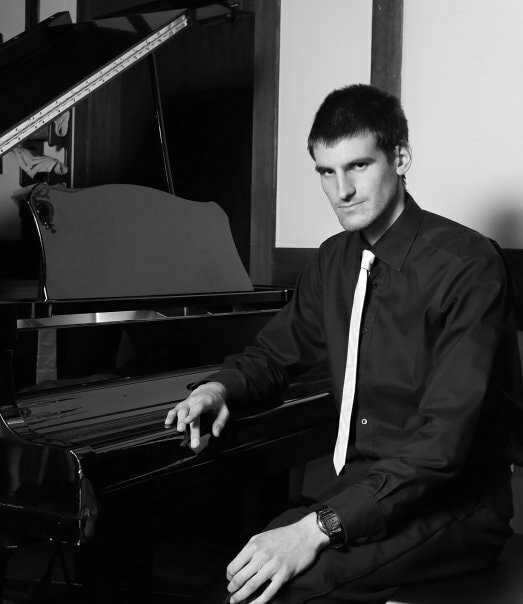 I teach piano and accompany at a couple of schools. I also do home tuition, and have recently started teaching a beginner’s course in magic and illusion! What’s been your most embarrassing moment ever? Once, I was going on holiday with my parents as a young teenager. At the airport, I was stopped at the airport scanner and had my bag searched. They’d seen something on the x-ray, although I hadn’t got a clue what. It turned out my mum had put a leek in my backpack without me knowing. She was going to cook with it. “Self catering, are we?” the security guard asked. I was too shocked to reply. I don’t think we even cooked it. We probably took it back home with us again. In summer 2018 got married to Annabel. We met many years ago through the choirs! Do you have any hidden talents that we should know about? As previously mentioned, I’m a keen amateur magician. I write thrillers, and my novel SHARK BAIT is currently available on Amazon with many 5* reviews! I’ve also got a piano book – FAVOURITE CHILDREN’S SONGS FOR PIANO – on Amazon, which sells quite well, and was reviewed in Music Teacher Magazine (“If you teach young beginners, get this book. You won’t regret it”) July 2018. A piano book of my compositions came out on 5th October (LIGHT & SHADE) and also a new thriller novel (MEMORIES UNSPEAKABLE) was released on 10th December 2018. Do you have any ambitions for the future? I’d like to be able to do less teaching and more writing – a combination of fiction and sheet music titles – as a career. Lots of ideas for forthcoming projects!